Fearing the rapacious power of Chicago's railroad system in the mid-1900s, Iowa Central Railway supporters fought for a north-south route across the state that would link Minneapolis and St. Paul with St. Louis. Such a route would put the needs of Iowa's citizens first and provide transportation for the state's agricultural and industrial trade. Analyzing the origins, growth, and eventual dismantling of the Iowa Central Railway, which traversed the state from Ackley to Zearing and Mason City to Marshalltown, Don Hofsommer examines how this unremarkable, "plain vanilla" railway was an example of the life cycle of the American railroad industry. 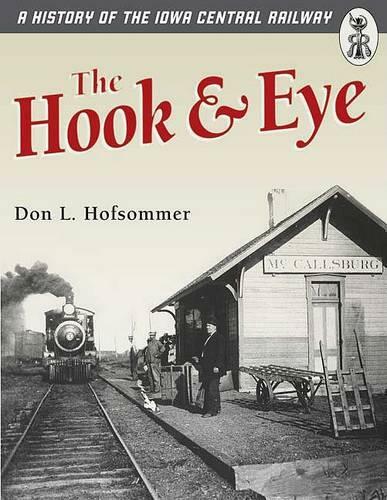 "The Hook & Eye" demonstrates its symbiotic relationship with its customers. Born in ambition but never rising far above its obscure origins, the Iowa Central eventually fell to outside competition from railroads based in greater metropolitan areas and was made part of the Minneapolis & St. Louis Railway in 1912.Drawing the story from station records, annual reports, newspaper articles, and interviews with former employees, "The Hook & Eye" brings both the industry and human sides of railroading into sharp and memorable view.